A week ago, Firebase announced Cloud Firestore, an awesome NoSQL document database that complements the existing Realtime Database. React Native Firebase (RNFirebase) is proud to announce support for both Android & iOS on React Native. To get started, we’ve made a starter app which is all setup and ready to go — simply clone/download it and follow the instructions in the README! 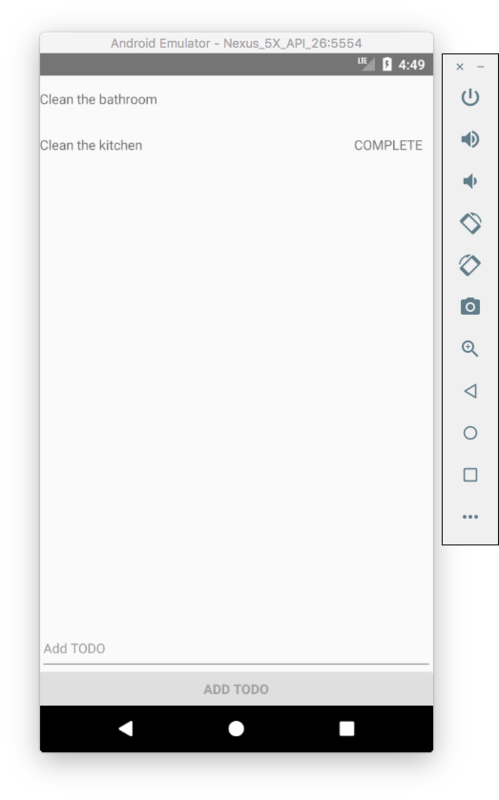 Lets go ahead and build a simple TODO app with Cloud Firestore & RNFirebase. Assuming you’ve used the starter app mentioned above or added react-native-firebase manually to an existing project (the docs are here), we can get started! Cloud Firestore allows documents (objects of data) to be stored in collections (containers for your documents). 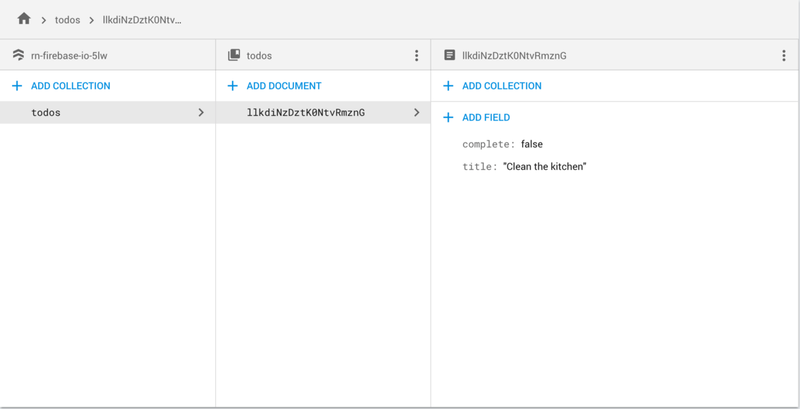 Our TODO app will simply hold a list of todo documents within a single “todos” collection. Each document contains data specific to that todo — in our case title and complete properties. The first step is to create a reference to the collection, which can be used throughout our component to query it. We’ll import react-native-firebase and create this reference in our component constructor. For blog readability, we’ll add the styles in-line however you should use StyleSheet for production apps. The screenshots are from an Android emulator, however the following will also work in an iOS environment! 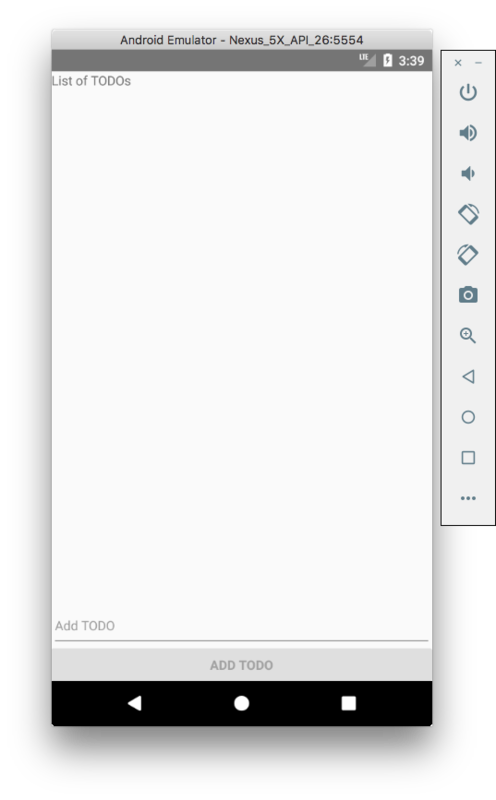 We now need to hook the text input up to our local state so we can send the value to Cloud Firestore when the button is pressed. To add a new document to the collection, we can call the add method on the collection reference. Lets hook our button up and add the todo! When our button is pressed, the new todo is sent to Cloud Firestore and added to the collection. We then reset the textInput component state. The add method is asynchronous and returns the DocumentReference from a Promise if required. Make sure you have permission to add data to the collection on your Rules page! Even though we’re populating the collection, we still need to display the documents on our app. Cloud Firestore provides two methods; get() queries the collection once and onSnapshot() which gives updates in realtime when a document changes. 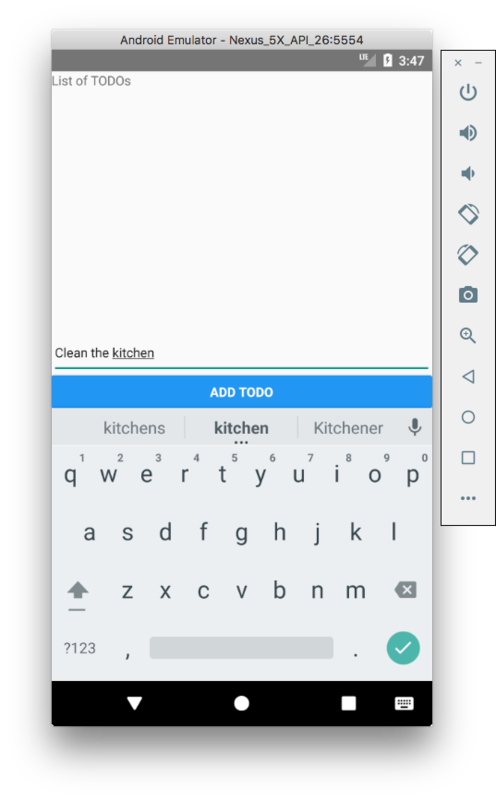 For our TODO app, we’ll want realtime results. Lets go ahead and setup some more component state to handle the data. We need a loading state to indicate to the user that the first connection to Cloud Firestore hasn’t yet completed. We also added a unsubscribe class property which we’ll see the usage of next. onSnapshot returns an “unsubscriber” function to allow us to stop receiving updates, which we call when the component is about to unmount. Note: an arrow function (=>) is used here to ensure the onCollectionUpdate method is bound to the Todos component scope. We use the snapshot forEach method to iterate over each DocumentSnapshot in the order they are stored on Cloud Firestore, and grab the documents unique ID (.id) and data (.data()). We also store the DocumentSnapshot in state to access it directly later. Every time a document is created, deleted or modified on the collection, this method will trigger and update component state. Now we have the todos loading into state, we need to render them. A ScrollView is not practical here as a list of TODOs with many items will cause performance issues when updating. Instead we’ll use a FlatList. You may notice that we’ve got a Todo component rendering for each item. Below we’ll quickly create this as a PureComponent. This will provide huge performance boosts in our app as each row will only re-render when a prop (title or complete) changes. This component just renders out the title and whether the todo document is completed or not. It’s wrapped in a TouchableHighlight component, allowing us to make it a touchable row. When the row is pressed, we can grab the ref (DocumentReference) directly from the doc prop (DocumentSnapshot) and update it using the update method (which again is asynchronous if you wish to handle errors). We can now toggle the todos completed state and not worry about local state as our onSnapshot subscription propagates the updates from Cloud Firestore back to our component in real time, awesome huh?! You should see the following — realtime interaction with Cloud Firestore! This is just a taster of what react-native-firebase and Cloud Firestore can do for your React Native applications. If you want to keep up to date, you can follow us here, on Twitter, over at the main GitHub repo or chat with us on Discord.